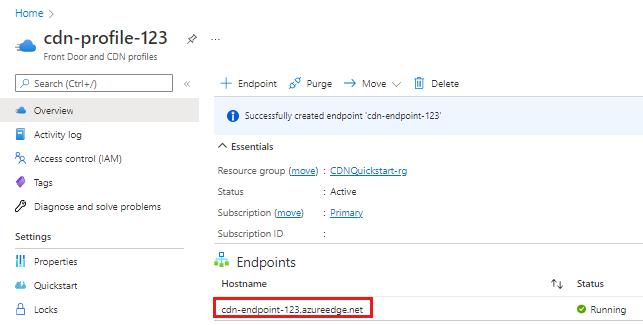 In this quickstart, you enable Azure Content Delivery Network (CDN) by creating a new CDN profile and CDN endpoint. After you have created a profile and an endpoint, you can start delivering content to your customers. For the purposes of this quickstart, you must have created a storage account named mystorageacct123, which you use for the origin hostname. For more information, see Integrate an Azure storage account with Azure CDN. Log in to the Azure portal with your Azure account. A CDN profile is a container for CDN endpoints and specifies a pricing tier. In the Azure portal, in the upper left, select Create a resource. Select Web + Mobile, then select CDN. The CDN profile pane appears. Name Enter my-cdn-profile-123 for your profile name. This name must be globally unique; if it is already in use, you may enter a different name. Subscription Select an Azure subscription from the drop-down list. Resource group Select Create new and enter my-resource-group-123 for your resource group name. This name must be globally unique. If it is already in use, you may enter a different name or you can select Use existing and select my-resource-group-123 from the drop-down list. Resource group location Select Central US from the drop-down list. Pricing tier Select Standard Verizon from the drop-down list. Create a new CDN endpoint now Leave unselected. Select Pin to dashboard to save the profile to your dashboard after it is created. For Azure CDN Standard from Microsoft profiles only, profile completion usually completes in two hours. After you've created a CDN profile, you can use it to create an endpoint. 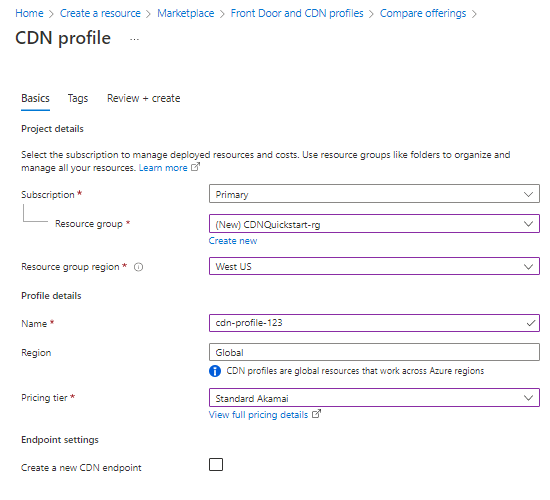 In the Azure portal, select in your dashboard the CDN profile that you created. If you can't find it, select All services, then select CDN profiles. In the CDN profiles page, select the profile that you want to use. The CDN profile page appears. Name Enter my-endpoint-123 for your endpoint hostname. This name must be globally unique; if it is already in use, you may enter a different name. 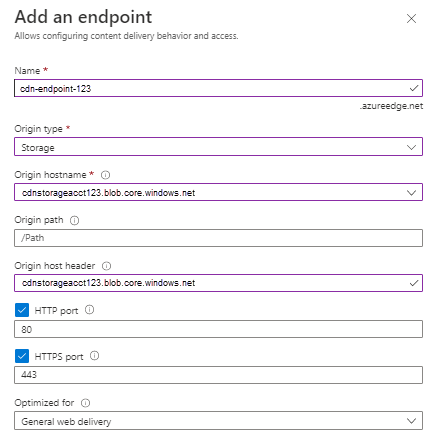 This name is used to access your cached resources at the domain <endpoint name>.azureedge.net. Origin hostname Enter mystorageacct123.blob.core.windows.net for your hostname. This name must be globally unique; if it is already in use, you may enter a different name. Origin host header Leave the default generated value. Protocol Leave the default HTTP and HTTPS options selected. Origin port Leave the default port values. Optimized for Leave the default selection, General web delivery. Select Add to create the new endpoint. After the endpoint is created, it appears in the list of endpoints for the profile. From the left-hand menu in the Azure portal, select Resource groups and then select my-resource-group-123. On the Resource group page, select Delete resource group, enter my-resource-group-123 in the text box, then select Delete. This action will delete the resource group, profile, and endpoint that you created in this quickstart.